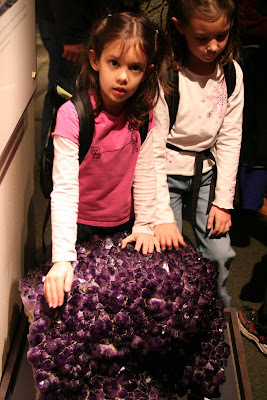 When singing the praises of the Hope diamond to your children, one should remember the interpretation of the word "huge". Because "huge diamond" in a little girl's vocabulary translates into something along these lines. And when it is the culmination of an extended museum tour, there might be much disappointment and possibly even some frustration. Because this is not huge (according to said 6-year-old). The quartz was much more impressive. Perhaps someday she'll be more persuaded. Someday. 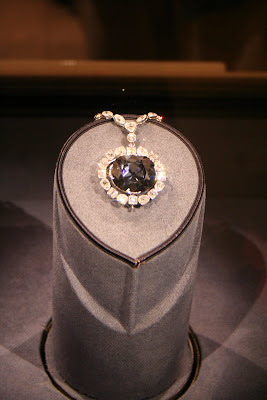 I have to laugh out loud to myself right now because when I was about 10 years old I went to the Smithsonian in Washington D.C. and saw the Hope Diamond. I was so excited to see the BIGGEST diamond known to man...and was very sadly disappointed when I saw it was no bigger than a quarter. Needless to say, I found more excitement in the tropical frogs than I ever did in the diamond!! LOL That's exactly what I thought when I saw it years and years ago.